Brazil is set to host the 2014 FIFA World Cup and 2016 Summer Olympics. As with the 2010 World Cup in South Africa, and the 2008 Olympics in China, Brazil is using the two sporting events to showcase its rapid development and encourage investment. All of this is further magnified by the fact that the Brazilian national soccer team has dominated the sport for the last 100 years. The team has won the World Cup a record 5 times, in 1958, 1962, 1970, 1994 and 2002. It is the only team to succeed in qualifying for every World Cup competition ever held. Large international sporting events are often an impetus for massive urban redevelopment projects. The 2014 World Cup is scattered among 12 cities in Brazil, which is roughly the size of the continental U.S. To prepare for the nationwide event, Brazil is upgrading its transportation infrastructure, from its airports to its subway lines. 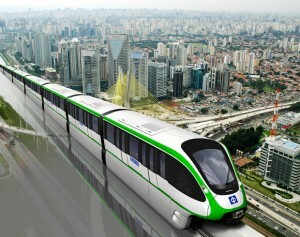 Sao Paulo, which will host both World Cup games and the soccer competition in the 2016 Olympics, just awarded a contract for $862 million to build the city’s first elevated monorail between the airport and its existing subway system. The need for public transportation updates are keenly felt in Sao Paulo. Subway service is limited, and the city is in a state of perpetual gridlock, making buses and more informal forms of public transit, like private vans, slow and inefficient. Sweeping infrastructural improvements can, in theory, have a lasting positive effect on an urban area. When built to serve a temporary purpose, these projects are often a mixed blessing, at best, for urban inhabitants. China’s questionable urban renewal practices during the Olympics in 2008 and Montreal’s 1976 Olympic Stadium, which took Montreal’s taxpayers 30-years to pay off, are particularly infamous. Infrastructure projects, especially in the developing world, need to be flexible and adaptable. They also need to benefit the whole population, hence the term public. Intermodal transit linkages are important. However, focusing on one expensive line, which will serve a narrow segment of the population once the World Cup and the Olympics are over, seems short sighted. The city needs holistic public transit upgrades and extensions, that will benefit a broader segment of the population. 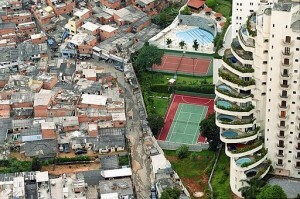 Sao Paulo- a city that is infamous for its broad class divide – will come under international scrutiny in both 2014 and 2016. It should seek to fund transit projects that will weave favelas into the fabric of Sao Paulo, rather than those that will reinforce their separation.